Zhané Warren collaborated with Matt Slater to produce 2017’s Edition S: Gentle Passing. The image depicts a cloud formation, with a horizontal band of darkness across the bottom third of the frame. 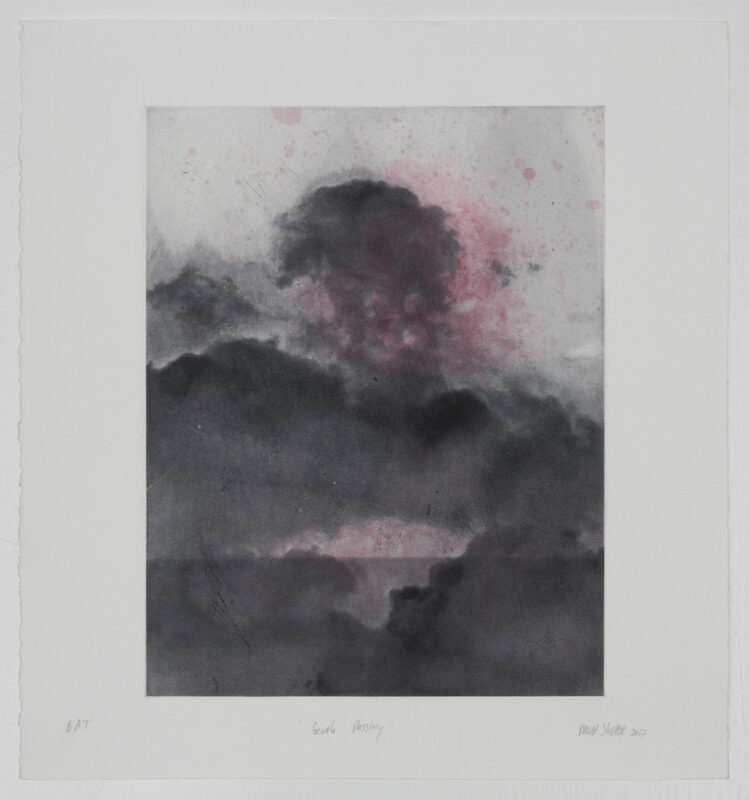 Although the dark band is simply a result of Matt’s experimental way of working, in the final image, it comes to suggest the sea, and the clouds could equally be mistaken for plumes of smoke. The romantic nature of the image is undercut by an acidic burst of pink, which shatters the quiet of the grey billows. Scratches and specks also cut through the clouds, precluding sentimentality. Matt is a photographer who primarily works in the darkroom and with analogue processes. Through his exploration of the craft, Matt deconstructs both images and processes to create a visual language that blends archaic process and current technology. The image that provided a starting point for Gentle Passing was shot using photosensitive paper instead of film. The affordability of shooting directly onto paper in this way has allowed Matt to experiment freely. An important aspect of this method is the necessity of embracing chance and accident. Perhaps the most captivating characteristic is that the paper chronicles traces of the process – scratches, fingerprints and dust specks remain as a part of the image, representing the artist’s physical participation in the work and the environment in which the work was made. This quality was a guiding factor in the creation of Edition S, for which the first step was adapting a photograph shot my Matt in order to create a photogravure. The negative image was scanned, inverted and modified in Photoshop. To create the photogravure plate, a positive of the image was first exposed onto light sensitive pigmented gelatin tissue, thus inverting the image back to a negative state. The gelatin tissue was then laminated onto a copper plate; in this step the two surfaces bond completely. Next, the gelatin on the plate was developed, to remove the unexposed gelatin. What remained was the negative image. The copper plate ventured from there through an etching routine in ferric chloride, commencing with the absolute blacks, then the shadows, the midtones to the lights, all the while keeping the highlights in place. The positive image is ushered back in through etching. In the digital image, much of the “chance” visual information created by the shooting process – scratches, dust, and so on – was eliminated. This matter was reintroduced later in the printmaking process via hardground etching. For this, the plate was prepared with hardground for Matt to take away with him. He put the plate unprotected into his bag, and allowed the contents to create marks in the hardground for the duration of an afternoon. This approach echoes his approach to photography, in which he is also not certain of the results. Every time a process is applied, the material that holds the image is made redundant – shedding, so to speak, by means of the method. The image went through a continuous transformation, eventually culminating in an impression on paper – the last material to hold the image. The metamorphic nature of the process is captured in the ethereal quality of the image, and alluded to in the title – Gentle Passing. Born in East London in 1994, Matt Slater currently lives and works in Cape Town. He studied photography at the Cape Town School of Photography and after graduating he worked for two years tutoring students and teaching part-time courses. In 2017 he participated in a three-month residency at Amplify Studios in Cape Town. During this residency he created a new body of work, The Arboretum, that was exhibited in the Amplify Studios Gallery. His work has been featured online in multiple websites and magazines such as Between 10 and 5, GUP Magazine, Phases Mag, The Latent Image, Lomography Magazine and Mull It Over. Gentle Passing has been produced in an edition of 70 on Zerkall Intaglio 250gsm. Accompanying the edition are 5 Artist’s Proofs, 2 Printer’s Proofs, a Publisher’s Proof, Hors de Commerce and Bon à Tirer.